The Chuck-Style Rotary is used for cylindrical object such that the material is clamped by the chuck. The material is rotated by degrees of chuck rotation. Applicable materials include wooden dowels, pencils, pens, pipes, rod..etc. This model is also referred to as the XZ-K-I unit. Using the Roller-Style Rotary attachment. .. PDF File .. 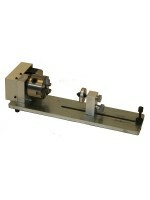 The Chuck-Style Rotary is used for cylindrical object such that the material is clamped by the chuck. The material is rotated by degrees of chuck rotation. Applicable materials include wooden dowels, pencils, pens, pipes, rod..etc. This model is also referred to as the XZ-K-I unit. .. The Chuck-Style Rotary is used for cylinder object such that the material is clamped by the 1/2" Jacob's Chuck. The material is rotated by degrees of chuck rotation. Applicable materials include primarily round objects with diameter smaller than 5/8 inches. Examples: wooden dowels, pencils, pens, pipes, rod..etc. This model is also referred to as the XZ-K-II unit. Using the Roller-Style Rotary attachment. .. PDF File .. The Roller Rotary is for cylindrical object such that the material is rested on the roller. As the rollers turn, the contact friction with the rubber O-rings causes the material to also turn. 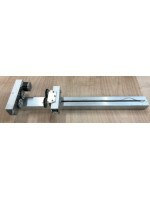 The material is rotated by contacted surface movement of the rollers. This rotary attachment is best when used on a variety of materials and all of the Items with diameter larger than 1 inch. 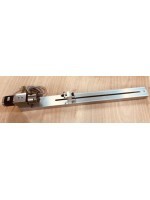 Applicable materials include wooden dowels, wine bottles, wine glasses..etc. Using the Roller-Style Rotary attachment. .. PDF File .. The Roller Rotary is for cylindrical object such that the material is rested on the roller. As the rollers turn, the contact friction with the rubber O-rings causes the material to also turn. 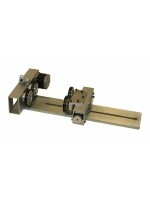 The material is rotated by contacted surface movement of the rollers. This rotary attachment is best when used on a variety of materials and all of the Items with diameter larger than 1 inch. Applicable materials include wooden table legs, wine bottles, wine glasses, baseball bats,.etc. ..